Sun 'N Lake Golf Club unveiled a new veterans monument on Sunday, just in time for the national commemoration of Veterans Day on Tuesday. 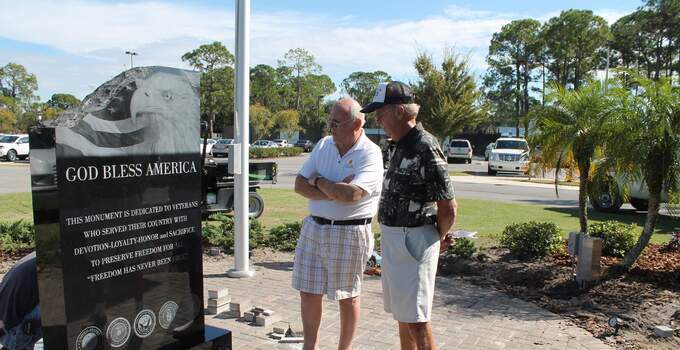 The six-foot tall, four-foot wide, black granite memorial was unveiled at the 2014 Sun ‘N Lake Men’s Golf Association Veteran’s Tournament. A number of members of the community spoke at the 30-minute-long ceremony, including several military veterans, according to Highlands Today. The granite has also been etched with “God Bless America” and the logos of the five branches of the U.S. military. The monument, which is the culmination of a year's worth of planning, cost $12,000 to build.